The last week of January – first week of February, it is Winter time, the Big Apple often covered by snow, freezing temperatures, sometimes a Epic Blizzard preventing you to get in (or out), but the place to be for the die-hards of the Drawings Jet Set. This is the start of the new season, when art dealers show their best drawings in galeries on the Upper East Side of Manhattan. During this week the main auction houses, Christie’s and Sotheby’s have their first sales of Old Master drawings and paintings. International private collectors and museum curators compete to make their first acquisitions of the new year. 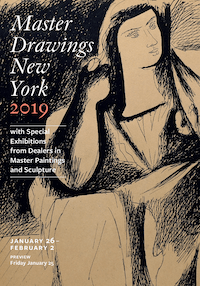 On Tuesday January 29th, 2019 at 4 pm, our sister periodical Master Drawings will host the Third Annual Symposium Master Drawings: The Next Generation at the Albertine, 972 Fifth Avenue, a ticketed event. See more on the Master Drawings New York website. Download the 2019 brochure here.